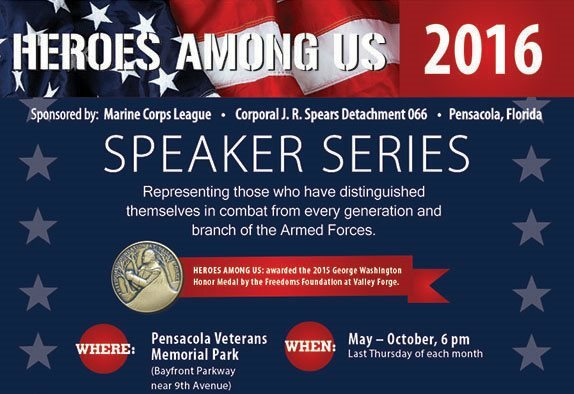 Come join us this Thursday at 1800 (6:00 PM) at our very own Veterans Memorial Park for our second installment in our Heroes Among Us Speaker Series. The second installment in the series, "Native American Warriors Night,” is presented by Cpl JR Sears Detachment 066 of the Marine Corps League. Guests of honor will be Lieutenant Colonel Kirby Locklear and USAF 1st Sergeant Shannon Peavy, USA. All featured stories are from local civilians, military veterans, and active duty members. The Veterans Memorial Park collects donations for its "Marines in Distress" fund, which provides a hand up- not a handout- to military veterans who need assistance. The scheduled 2016 Heros Among Us Series is free and open to the public. Water and light refreshments will be provided; people should bring their personal blankets or chairs. In the case of rain, the event will be moved to Rosie’s at Seville Quarter. The series is sponsored by the Marine Corps League and is presented by Corporal J.R. Spears of Detachment 066. Heroes Among Us was awarded the 2015 George Washington Honor Medal by the Freedom Foundation at Valley Forge.